Finding a sticky piece of chewing gum stuck fast on a rug, carpet, armchair or sofa can be irritating, to say the least. Luckily, there is a way to deal with the problem. 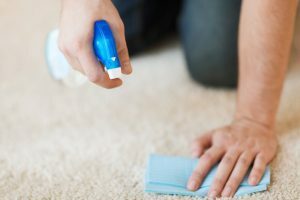 Try the simple steps below – and if that doesn’t work, or your fabrics or carpets are too delicate or valuable to take the risk, it’s time to call in a professional cleaning company. To start with, try to remove as much of the gum as possible. You can use a blunt knife edge to scrape it off gently and without pulling or otherwise damaging the fabric. An old trick to help the gum come off more easily is to freeze it. If the item is too big to simply pop into the freezer, place a thick plastic bag filled with ice cubes onto the affected area until the gum has hardened. Make sure the plastic bag is not too thin, otherwise is might stick to the gummy area and make the problem worse! When all the chewing gum has gone, you’ll be left with a stain that should be easy to deal with. 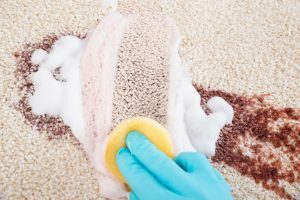 Dab or sponge the stain with a paper towel or clean cloth dipped in a dry cleaning solution, or alternatively use a special chewing gum remover that is safe to use on your fabric or carpet. It’s always wise to check on an inconspicuous area first, just in case the colour runs or the fabric reacts strangely. Next, gently blot the stain so that the solvent is absorbed, and repeat the process until the stain has completely gone. If you are unsuccessful at shifting the stain, you can try using a solution of warm water, a tablespoon of washing up liquid and a tablespoon of white vinegar. Sponge the stain with the solution, then blot until it has disappeared. Be careful not to get the area too wet, and repeat the process until your upholstery or carpets are completely stain free. Finally, remove any soapy residue with cold, clean water and a fresh sponge or cloth, then blot dry. If you need specialist advice for any problems with rugs, carpets or upholstered furniture, Apple Clean can help. As carpet cleaning an upholstery cleaning experts we offer extensive stain removal services for all types of home interiors. Why not give us a call on 0800 5874571?